Not sure where the turn-in is for this. Not showing up on map. You get a Kua'fon in Pterror Rise. And he has a reputation bar above his head. Now just do daily quests to get reputation with him. Right now you need to go over the top of reputation bar to be able to complete the meta quest. You also need to relog to be able to complete the meta. This quest is part of the Zuldazar Pterrordaxzähmen leicht gemacht questchain. So I came back to the Pterror Rise the day after I picked up this quest and I had a daily quest from Schwingenhalter Goja. 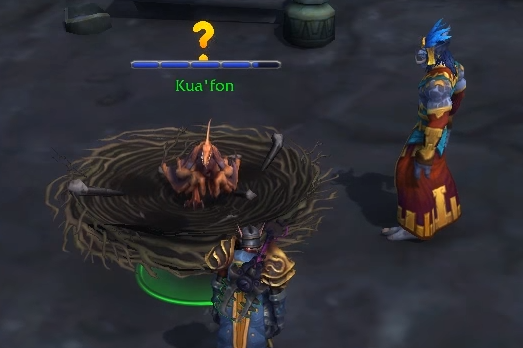 It didn't show on my map as a world quest, but when I completed it, the blue bar above Kua'fon started to fill. Der. Stood there trying to figure this out for an embarrassing amount of time. When you rescue him down below where he's sitting on some roots there's a spear you click to free him. I didn't think to turn my camera around for much too long. Just finished filling the bar, it showed another one.. I seem to have a problem doing this quest, might be a bug. Goja does not give me a daily quest to fill the rep bar, any suggestions? For those that are wondering why no daily quest is popping up for you after getting this quest in your log (even after relogging like some are saying to do on here) you need to wait until the next daily reset to begin. I am told by Wingminder Goja that he heard a shriek and that I should find it. any idea where it may be? Could it have possibly died? Oops, just found it. Had to widen my search. The progress bar seems to regress a little bit for every day that you don't log in and do the daily so don't miss any days. Can't this little guy ever eat some kibble instead of running off and getting into trouble every day? I just mistakenly abandoned this quest, anybody knows how can I accept the quest again ? I'm trying to start this quest but Kua'fon does not appear at Pterror Rise for me.... does he only appear sometimes? Kümmert Euch um Kua'fon, bis er flugbereit ist. Seid gegrüßt, <Name>. Ich bin Schwingenhalter Goja. Ich hab von der Prüfung gehört, vor die Pa'ku Euch gestellt hat. Ich kann Euch helf'n. Ich beaufsichtige dies'n Horst im Auftrag meines Loas. Un' ich hab schon viele Eier zu glorreich'n Kampftieren werd'n sehen. Es liegt noch 'n langer Weg mit viel'n Prüfungen vor Euch, aber die Freundschaft eines Pterrordax is' es allemal wert. Aber der Kleine is' noch jung. Kümmert Euch um seine Bedürfnisse, solang er noch im Nest hockt. Wenn er bereit is', die Welt zu erkund'n, wird er's Euch wiss'n lassen. Viel Glück, <Name>.